AirBand filter ON-OFF response plot. The set includes: AirBand filter filter and user manual in CDROM format. Generak Purpose Low Pass Filters range from 100kHz up to 500MHz. Range of thirty five frequencies Low Pass Filters. Essential on measurement applications, suitable for Receivers , RF Generators, Local oscillators, RF amplifiers, RF mixers, etc. - Input/Output impedance: 50 Ohm. - Sharp roll-off, Stop band attenuation: see plots. - Connectors: BNC or SMA. Customize versions available. General purpose Low Pass Filters. Other connector options available, please ask. Mini Low Pass Filters., user manual in CDROM format. MW Broadcast Band Rejection Filter. BCB filter. (No relays) 200 Watts power rating. Attenuates signals from the MW broadcast band more than 80 dB. Connected in-line with any 1.8 - 60 MHz HF transceiver, transmits right through it. Instantly switches from transmit to receive and back again. No switching relays, no moving parts. No relay time delays. 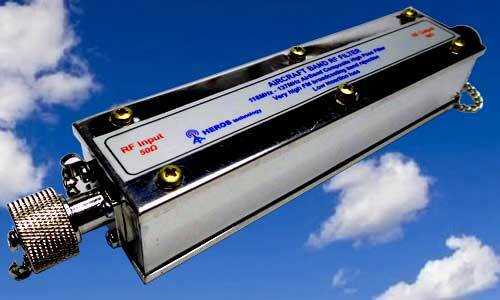 Compatible with the output of a typical class HF transceiver. 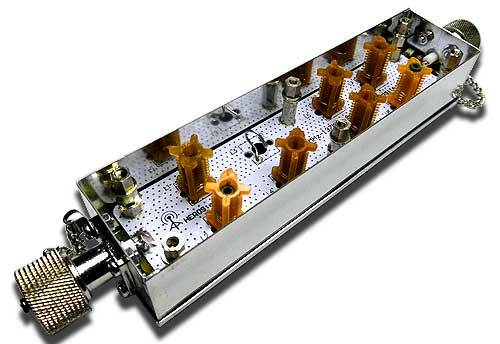 Also suitable to be inserted between a HF transceiver and an amplifier or a tuner. Totally passive T/R (Transmit/Receive) operation. Does not require connection to a power supply. - T130 size toroidal cores. - 1% tolerance Silvered mica capacitors. Attenuates the spurious signals from AM broadcast band, well know enemies of SW receivers, that cause birdies and IMD, overloading and de-sensing receiver front-ends. Very sharp slope occurring at 1.8MHz, keeps without attenuation all signals at 1.8MHz and above, including the CW portion of the 160 meters band. Low pass band insertion loss, less than 1 dB typical on all pass band response. No switching relays are needed. Suitable for inserting between transceiver and antenna. BCB filter and user manual in CDROM format.